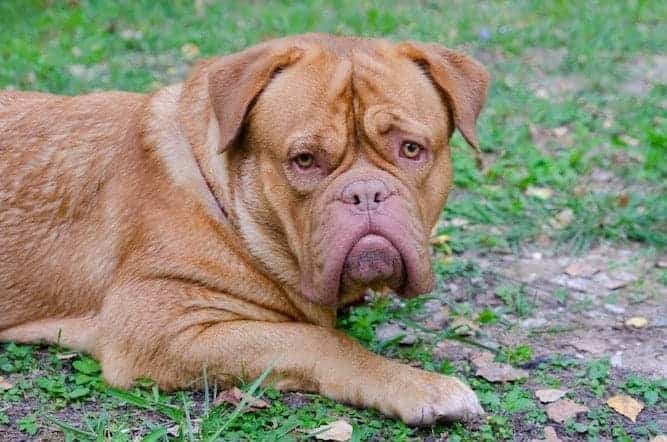 Courageous and companionable are two of the Dogue de Bordeaux temperament traits you can expect from this muscular teddy bear of a dog. Put simply, the name is a combination of “Dogue,” which you should pronounce like “vogue” and “Bordeaux,” which you should pronounce like the wine. The Dogue de Bordeaux dog originated in France in the 14th century, specifically southern France near Bordeaux (hence the name). 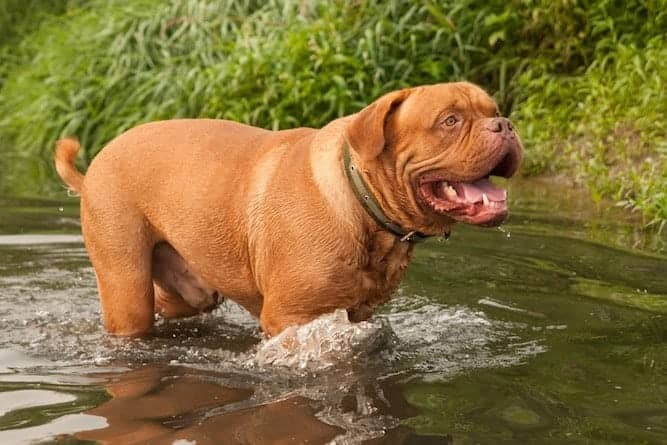 The Dogue de Bordeaux used to come in two varieties: the Dogue and the Doguin. However, the Doguin has since become extinct. No one is sure where the Dogue de Bordeaux came from. Theories include the Tibetan Mastiff and the Bullmastiff, among others. In fact, the Dogue de Bordeaux go by other names such as the Bourdeaux Mastiff or French Mastiff. 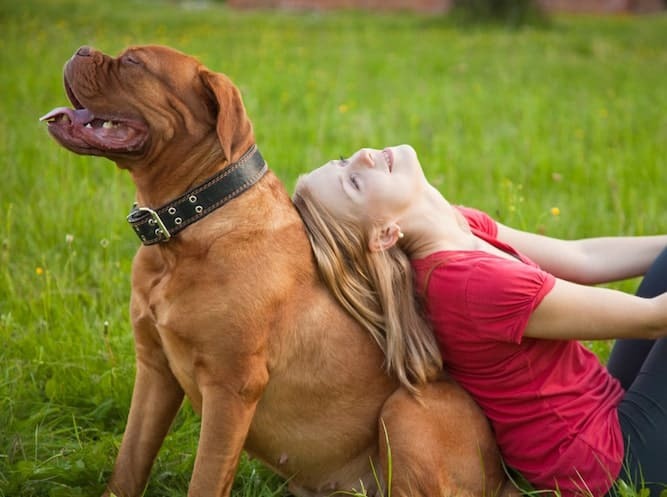 There are least six Dogue de Bordeaux temperament traits that you “need-to-know” if you own or are considering owning this dog breed. She is a dog that loves her family deeply, from its oldest members to its youngest. She is calm and affectionate with adults and babies alike. She is an honorable dog who is faithful to her master. This makes training her much easier – provided she is properly socialized and has graduated from obedience school. You may see a dog this size and worry about getting on her bad size. However, the Dogue de Bordeaux is the typical “massive dog is actually a calm teddy bear” kind of dog. Despite her massive size, she'll think nothing of curling up with you on the couch to give you huge kisses with her massive tongue. She loves you, and she lets you know it. She isn't afraid of anything, but then, if you looked like her, you probably wouldn’t be afraid of much either. She will confront a stranger without any fear whatsoever, letting them know that she's in charge around here. She's kind of like a bouncer in a nightclub. She won't go around picking fights, but if you pick one with her, she will be sure to finish it. While she has earned the reputation of being a fantastic watchdog, this is almost by accident. Rather than resort to being aggressive, the Dogue de Bordeaux just uses her size and bark to scare off intimidating strangers. In addition to these traits, she's surprisingly active for such a large dog. She is also not the ideal pet for apartment living. This is a dog that needs to be active, with moderate daily exercise. One look at the Dogue de Bordeaux's soft gaze tells you she's a big softie. This is not a breed you can train with a heavy hand. Be firm and consistent, but do not resort to harsh scolding or corporal reprimanding. This is a dog that you must teach to trust you, else you'll never be able to train her the way you want to. For this breed, early socialization and obedience training are musts. One of the most important things you need to know about grooming this dog is that she's a drooler. As such, you must pay special attention to the wrinkles on her face to ensure they are clean and dry. You should tend to her ears weekly, on average, though she may need daily attention depending on how much she drools. Also check her ears regularly for any dirt or signs of infection, and keep them clean. She should have a bath about once a month. In between baths, wipe her down with a damp towel to ensure she stays looking and smelling nice. She sheds year round, so be sure to brush her regularly for the sake of her comfort…and your carpets. You should not engage a Dogue de Bordeaux in high-impact exercise until she is at least 18 months of age. This is because such an exercise can strain her developing joints and muscles. Don't allow her to do things as a puppy like run up or down the stairs, or jump from surfaces that are taller than she is. A great exercise she can do is swim, and from any age. As she gets older, she can participate in more strenuous activities. 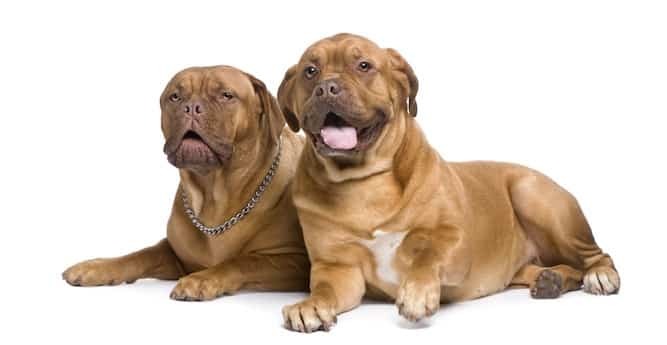 Most Dogue de Bordeaux are healthy dogs but, just like any dog, there are certain health issues that affect the breed. The Dogue de Bordeaux lifespan is upsettingly short at between 5 and 8 years. She, therefore, may not the best choice for a family dog in a family with young children. A typical Dogue de Bordeaux size is about 24 to 26 inches high for a male and only slightly shorter (23 to 26 inches) for a female. Insofar as a good Dogue de Bordeaux weight, she should weigh between 120 and 140 lbs. A healthy weight is important to good overall health and avoiding many problems. Provide high-quality food, moderate exercise and educate yourself on dog health so you can spot symptoms of diseases early. Note: The Ultimate Guide to Dog Health is a great place to get smart on Dog Health. Get a copy today. After reading up on the breed, you may have decided that you'd like to add a Dogue de Bordeaux puppy to your family. A Dogue de Bordeaux for sale is available either from a breeder or through a rescue or adoption agency. The price of a Dogue de Bordeaux sale varies, depending on which route you choose to go through. Compared to other breeds, the Dogue de Bordeaux cost is a little pricier. Dogue de Bordeaux puppies can cost as much as $1,300. However, the average Dogue de Bordeaux price is around $1,000. The price of a dog can vary, depending on where you get it from, and how much a breeder wants to charge. The rarity of the breed can also play a factor as to why some dogs cost more than others. This is one such reason why the Dogue de Bordeaux is so expensive. If you would like to adopt a Dogue de Bordeaux puppy, you can find one through a local rescue organization or adoption center. A Dogue de Bordeaux adoption will always cost less than if you purchase the dog from a breeder. An adoption is also perfect for you if you would rather adopt an older dog than train a puppy. Many people don’t want to have to put up with the destructive behavior that often comes with trying to train a new puppy. This includes housetraining the puppy and teaching her not to chew things she shouldn't be chewing, like your shoes. Adoption is also a great route to take if you're interested in a Dogue de Bordeaux mix. This is because fewer people are willing to part with a more expensive purebred than a mix. 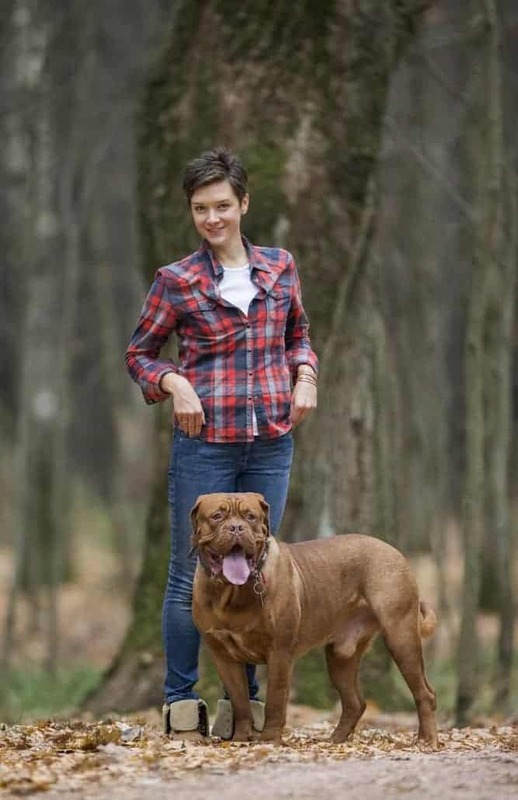 If you're in the market for a Dogue de Bordeaux, you may not know where to look first. A good resource to consult is The Dogue de Bordeaux Society of America. While the organization explicitly states that it does not endorse the breeders on its list, you can begin your research with the list they provide. This lovable, loyal, and even-tempered dog makes for a fantastic watchdog. She lets her size do the talking (along with a little talking from her), rather than getting aggressive. Be careful in how you exercise her. Only low-impact activities until she's 18 months. Swimming is a good one. Socialize her early and as often as possible. Obedience training classes are also a must. Together, these things make the act of training her much easier. Keep an eye out for health problems like epilepsy, bloat, and heart disease in this breed. Compared to other breeds, the Dogue de Bordeaux does not live very long. She's also pricier because she's rare. This may not make her the best investment for a family dog with young kids.